First time visitor or seasoned pro? Whether it is your first time attending Cottonwood Art Festival or an annual event on your calendar, here are a few answers to frequently asked questions to enhance your festival experience. Cottonwood is located in Cottonwood Park at 1321 W. Beltline Rd. in Richardson, TX. Parking is available across the street from the park at Richardson High School Stadium. A free shuttle is provided each day of the festival from 9:00 am - 9:00 pm. Click here to view a map. Do you accept credit card and cash? Festival food vendors, boutique and most artist accept major credit cards. ATM's are also located throughout the festival site for your convenience. Does Cottonwood have kid activities? Our pint-size Picassos will enjoy a wide array of art and craft activities in ArtStop. Children of all ages will have the opportunity to create a hat from scrap, design a wax hand, or practice their hand at sculpting clay on a real potter's wheel. Click here for additional details. Can I purchase a Cottonwood T-Shirt? Official Cottonwood t-shirts, bags, caps and more are available in the Boutique, located in the Lakeside Courtyard. The official festival poster featuring the works of selected artist Gregory Arth is also available for purchase. Don't miss out on your opportunity to take a little bit of Cottonwood home with you! Do you have food and beverages at the Festival? Cottonwood offers a variety of unique and tasty favorites from corn dogs, caramel apples, tex-mex favorites and much more! Make sure to stop by the Craft Beer Garden to enjoy a cold local brew! 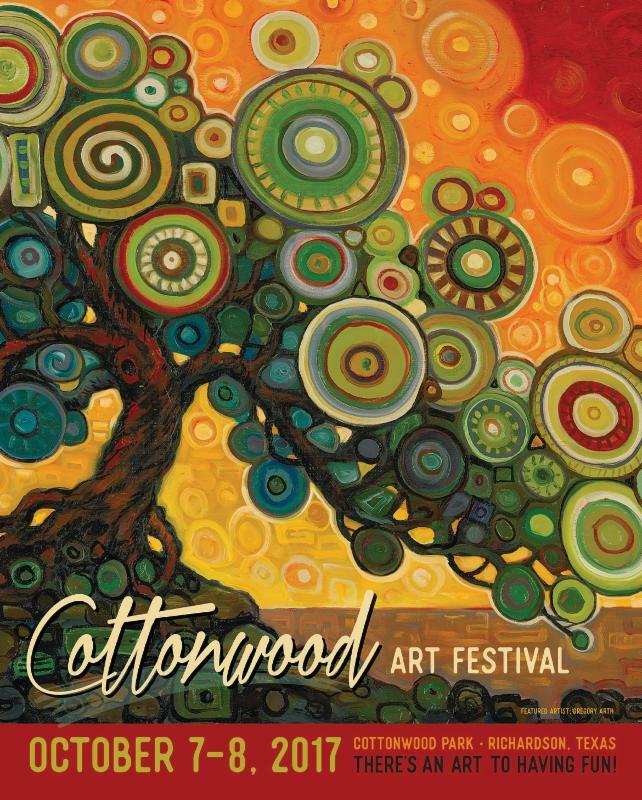 For additional festival information visit our website: www.cottonwoodartfestival.com. Don't forget...there's an art to having fun!